H. 7 3/16 x W. 6 3/8 x D. 3 1/2 in., Art Properties, Avery Library, Columbia University, Gift of J. G. Phelps Stokes (C00.1603.25). Now on view in Avery Library’s Wallach Study Center for Art and Architecture is an exhibition of Buddhist art from Art Properties. Entitled Wisdom of the East: Buddhist Art from the J. G. Phelps Stokes Collection, the exhibition showcases a selection of works of art from Tibet, Nepal, China, and Japan dating from the 12th to 19th centuries. This collection of over fifty sculptures and decorative objects was donated to Columbia in 1959 by James Graham Phelps Stokes (1872-1960), an alum of the College of Physicians & Surgeons and a New York City politician. His brother Isaac Newton Phelps Stokes was an architect whose projects included St. Paul’s Chapel on the Morningside campus. J. G. Phelps Stokes seems to have acquired his art collection during his travels abroad, his brother and he having visited Asia for the first time in 1892-93. 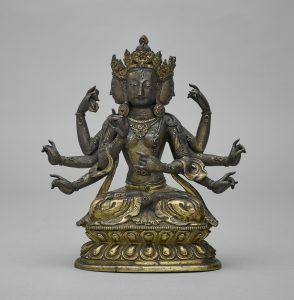 Most of the art Stokes donated to Columbia represents the rich visual cultures of Mahayana (“Greater Vehicle”) and Vajrayana (“Diamond” or “Thunderbolt”) Buddhism. In addition to this collection of art, Stokes’s papers and correspondence are deposited in Columbia’s Rare Book and Manuscript Library. The I. N. Phelps Stokes papers and architectural drawings collection is held in Avery Library Department of Drawings & Archives. The exhibition, curated by Roberto C. Ferrari in Art Properties, is open Monday through Friday, 9:00 a.m. to 5:00 p.m., and will remain on view until September 14, 2018. This entry was posted in Art Properties, Exhibitions on June 21, 2018 by Ted.